I went to a friend's Birthday celebration yesterday and missed the phone call my parents made to inform me that my grandmother, Jean Beekman, had passed away on Sunday night. In fact, I did not get the message until this morning. The message did not come as a shock, as her health had been steadily and painfully declining for some time. A sudden affliction of mouth cancer more than two years ago had left her with no choice but to be fed intravenously. This severely limited her mobility as she had to be fed three hours for every meal every day. My grandmother was a woman of great strength and courage, but she was only able to hold off the effects of such a prolonged battle for so long. The entire ordeal was very difficult for my grandfather, especially in the last few months. My aunts and uncles and my mother also had quite a bit of pain and worry. Her death, which occurred peacefully while she was sleeping, relieves the pain of watching her suffer. Although we have comfort in knowing she has moved on to a place of incomparable joy and beauty, we still mourn the loss of the joy and beauty she brought to our lives. 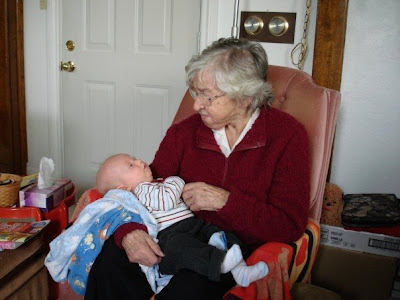 She survived the Depression and the Nazi-occupied Netherlands, she struggled alongside her husband to cobble a life together in a new land, she reached a level of assurance with the English language that few immigrants master, she raised five children, found great joy in spoiling all eight of her grandchildren, and she even had the opportunity to hold her first great-grandchild, Owen Langelaar. My grandmother was a Scrabble champion, a great chef, a loving mother and grandmother, and a woman whose strength of spirit was only surpassed by her love for her family and friends. Grandma, I miss you so much. Who remains a footnote in a museum gallery? De Zoete has a song called Mathilde in which he sings in both French and English. Of course, the song is mostly in English, but it reminds me of Daniel Lanois' song "Jolie Louise." Lanois has produced music for such greats as Ron Sexsmith, Bob Dylan, and U2. This often overshadows his own solo work which is also quite good. Daniel Lanois was born in Hull (now Gatineau) but moved to Hamilton, and so he has been influenced by two cities close to my heart. Enjoy the Franglais. "Jean-Guy, we must let you go"
kids are gone, and so is Louise.
. . . I warned you, it's ridiculous.
. . . If you go beyond this point you will expose yourself to a new level of ludicrity beyond made-up words like "ludicrity"
"I would like a book," the woman started, "A book with a blue cover." The round-headed man at the desk stared at her blankly as a photocopier hummed somewhere behind him. "Um, Sorry, I guess that's pretty generic," she admitted as she fiddled with her purse strings uncomfortably. The man continued to stare ahead blankly. "Well, there's a mystery in the book and there's two brothers who are trying to solve it," she added helpfully. The man blinked, but otherwise remained impassive. "They're twins named Joe and something," she continued. The man's head moved imperceptibly, his leafy hair rustling in the breeze of a humming fan. His hair sprouted from the top of his head in a strange greenish colour which the woman attributed to a bad hair dye. "The author's name is Dixon, something W. Dixon," she mused as she nervously chewed a long fingernail. The man's face was a stone wall. "Franklin! That's it, Franklin!" she laughed, "Franklin W. Dixon . . ."
Her voice trailed off as her sudden inspiration had not inspired anything in the brooding bulk in front of her. "So maybe you can type the name in your computer and tell me where to find it," she pointed at the computer beside him helpfully. His stony gaze didn't even flinch. "They have a friend named Chet and he drives a Jalopey," she offered, an edge in her voice. "Franklin W. Dixon! Type it into your computer, you moron!" she yelled. "Excuse me, ma'am, but I resent your tone," the man muttered almost inaudibly. "Well, I resent you sitting here like some kind of brain-dead tuber while you collect money from the municipal government," the woman jabbed a red fingernail two inches from the man's impassive face. "I don't work here," the man breathed. "Then why, might I ask, are you sitting at the librarian's desk?" "I dunno," the man mumbled. "You don't know?" the woman queried sharply. "Are you a, a, ehrm, uh," the woman was speaking gently now, "addicted to drugs?" " . . . so . . . why are you here?" "What's your name?" the woman asked slowly, carefully pronouncing each syllable. "People call me Brassica Rap L," the man intoned. "That's an odd name," the woman said in an over-friendly way, the tone many adults reserve for the mentally handicapped or extremely young. "Not really," the man said, "I share it with millions of others." "I find that hard to believe. This is the first time I've heard it," the woman shook her head, looking at the expressionless man with a mixture of pity and outright confusion. Suddenly the man's round forehead became a deep shade of purple, "Maybe you should remember that name the next time you so casually feed my brethren to an overgrown cow!" The woman jumped back, startled by the sudden animation of the man, "what?" "Say the name! Say the name Brassica Rap L . . . savour the name of the vegetable you so calmly allow your livestock to consume," the man snarled, his bulbous nose red and his large nostrils flaring like tap roots. "You're crazy!" the woman gasped. "Am I?" the man growled, "or is your mind having conniptions at the very idea of a tasty bit of creamed turnips with gravy covered steak or stewed turnips a la francais or some mashed turnips with a side of stuffed turnips smothered in goat cheese? The only crazy person is the one who would think it harmless fun to consume a helpless vegetable." 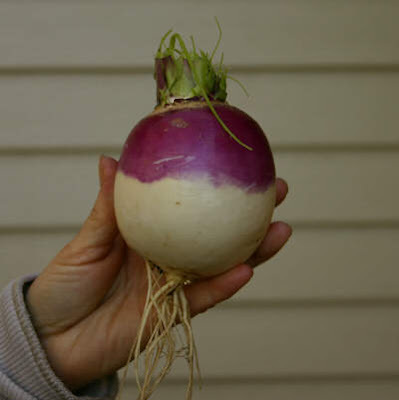 "You think you're a turnip?" the woman asked incredulously. "You did not think it so ridiculous to call me a tuber a minute ago," the man argued. "I-I . . ." the woman stuttered and then trailed off. "By the way, your book can be found in the adolescent literature section," the man offered.